Critical thinking is a skill that, when absent, contributes to the rise of recent phenomena like runaway fake news stories or hacking of government and corporate computers, and costs companies dearly in law suits, fines, penalties, and failed projects. The skill of critical thinking in modern business is often described as desirable when asking employers what it is that they are looking for in new hires (Hart Research Associates, 2013). Employers lament the inability of new employees to think critically and solve problems creatively – placing the blame firmly on the high school or college training of the incoming employees. In their article “Eight Habits of Effective Critical Thinkers”, Guinn & Williamson identify several qualities that clearly identify why critical thinking skills are so desirable (Guinn & Williamson, 2017). Among the behaviors identified are that critical thinkers are ‘more concerned about getting it right, than being right’ and ‘avoid the rush to judgment’. The trick to cultivating these admirable traits in employees is actually in training and encouraging a solid foundation in critical thinking. Learning how to think more effectively leads to better decision making and job performance. In this article, I’ll explore why critical thinking skills are so important to modern business, and in a series of activities that follow I’ll explore some methods that might prove useful for expanding the critical thinking skills of incoming employees. For the purpose of this discussion, I’m defining critical thinking as the skill(s) required to validate information and ideas based on verifiable evidence and sound logic. Critical thinking involves a well-organized thought process that is focused on solving problems, analyzing and researching relevant research, willing to challenge assumptions, open to new possibilities and approaches, aware of the limitations and scope of analysis, reflective and transparent. One interesting example of a critical thinking failure in modern business is when employees fall victim to scams based in logical fallacies, or fail to identify deceptive practices in business. There are many examples of this kind of problem, for example consider common problems with information security. One of the most common is falling victim to phishing scams in email. When employees are unable to discern fact from fiction – or learn to ‘trust their gut’ rather than validate facts, companies generally pay the price. Often the difference between critical thinking and non-critical thinking comes down to the difference between making decisions based on facts and logic, and making decisions based on intuition and emotion. Sometimes the problem is not so obviously attributed to emotion. It simply feels natural – ergo logical to the person making the decision. Just as we can make a habit of behaviors like brushing our teeth or pouring a glass of tea, we can and do habitually perform many tasks based solely on past experiences. You might habitually open a door for others to enter a room for example. You also might habitually sit with your legs sprawled open even to the discomfort of another passenger on a plane – not even considering that you are unfairly consuming the space. You might habitually move out of the path of an oncoming pedestrian because they are male and you are female. Note that there is very little logic in the aforementioned examples – but they are derived of past patterns. We often assume that when two events are related in one way, they must also be related by cause. We confuse coincidence with cause. Just because two things connect or coincide, doesn’t mean that one caused the other. At other times you might find that emotion plays a subtle role. Most of us use phrases like “my luck ran out” and “I’m due for a win” when usually there is no ultimate relationship between your odds of success in the current venture than in the prior. We call this the gambler’s fallacy. One example of the influence of the gambler’s fallacy interfering with decision making was documented in a recent publication from the National Bureau of Economic Research (Chen, Moskowitz, & Shue, 2016). The article identifies a pattern of behavior among professionals that demonstrates application of the gambler’s fallacy to successive decision making patterns. In essence, when a professional makes a series of topically or conceptually similar decisions (on independent cases), they are more likely to invert positive or negative recommendations in the wake of a series of prior recommendations. If they made a series of positive loan recommendations, the likelihood of a negative recommendation increases, even when a negative recommendation is not warranted by the data. The team found the same pattern in baseball umpires calling strikes, and immigration workers recommending asylum. 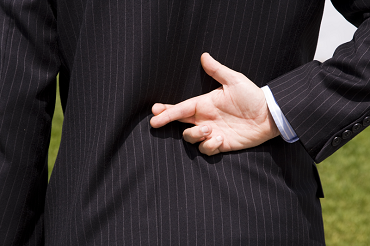 Just as people falsely believe that if they’ve flipped a coin twice, and got heads both times, they are more likely to get tails on the next flip. Of course that is the whole point of the gambler’s fallacy. The odds remain 50/50 no matter how many times you flip the coin. But the fallacy is deeply ingrained in the ‘beliefs’ and emotional reality of most people. The research team also found that the more experienced employees were less likely to suffer the effects of the gambler’s fallacy – suggesting that less experienced employees were more likely to include emotion and instinct in their decision making than more experienced employees (Chen, Moskowitz, & Shue, 2016). I recently attended a conference on behavior and learning. A major theme of the conference was the role of emotion of visceral reactions in the decision making process of learners. Michelle Segar (Segar, 2016) argued persuasively that recent research from the Journal of Consumer Research (Chang & Pham, 2013), the British Journal of Health Psychology (Sirriyeh, Lawton, & Ward, 2010) & the Annual Review of Psychology (Lerner, Li, Valdesolo, & Kassam, 2015) all provide evidence that emotion is more influential than logic in decision making. It is an argument that rings true for me. I remember an experience in a classroom as a young boy that echoed this life-lesson. Our fifth grade teacher used a simulation game to teach a critical thinking concept. Essentially we were to assume the role of town leaders, making decisions about whether or not to allow a new factory to be built within our imagined city. Some students argued that a factory would provide jobs, and some that it would encourage the economy. Some argued that it simply felt like the right thing to do, struggling to give any reasons for their inclination. Others said that it would promote more revenue in taxes, and it would encourage growth. I was concerned that there must be a catch. Life had already taught me that people would often present limited information or simply lie to make an ‘offer’ seem more beneficial than it actually was. The proposal sounded ‘too good to be true’ to my cynical ears. Eventually we learned that the project was in fact rife with problems. Pollution, competing tax break incentives, competition for local resources, and a host of other issues made the project a huge net loss for the imagined community. But the group –predictably– voted to support the project. In fact no amount of logic could persuade them that the proposal was in fact ‘too good to be true’. This simple aphorism ‘too good to be true’ dates back at least to the 1800s and is similar to other warnings that essentially suggest the same idea. People throughout history have always used deception and misdirection to manipulate other people. A similar phrase, caveat emptor, is well known in legal circles. Essentially this means buyer beware. (Caveat translates to “may he beware” and emptor represents the consumer in the expression.) The same form has been applied to the consumption of any message – caveat auditor. You’ll recognize the phrase from the title of this article. “Beware the receiver of any message” could easily be a modern battle cry for those inundated with advertisements, mass marketing, internet memes, deliberately deceptive fake news reports, the growing practice of social manipulation through push polling, and similar forms of agenda promotion via online discussion and sharing communities. It’s worth noting that to a marketer, many of these techniques are tools – often employed to inspire emotional attachment to goods and services. Learning to spot these techniques, and in some cases to utilize them, plays a tremendous role in modern business. While these warnings serve as a reminder of the universality of attempts to persuade individuals or systems, they also exist as aphorisms because the art of deception and manipulation with the intent to win a goal through manipulation has continued to grow at an alarming rate. Our improved methods of communication have democratized mass communication making it cheaper and easier than ever for anyone to reach the masses with well-targeted messages. While it once required enormous sums of money and elaborate infrastructure to push messages (both accurate and inaccurate) to the masses, the promotion of an agenda, false idea, con, or other manipulation of truth now requires little more than a clever meme and an internet connected computer. It is also worth noting that the reasons for the promotion of incorrect information don’t have to be deliberately devious to be destructive, or problematic. So Why Does This Matter To My Training Department? A growing number of businesses are relying more and more on publically available resources to inform, educate and update their personnel. You will see this trend reflected in articles touting the ‘end of organizational training’ or ‘end of the Learning Management System’. Why not? Using a search engine at the point of need has become the most common first inquiry in learning virtually anything (Wang-Audia & Tauber, 2014). As research, education, and training move rapidly to a self-serve delivery model, the onus is ever-increasingly on the individual to use a solid background in critical thinking in order to discern facts, uncover undisclosed specifics, verify sources of information, and clarify the specifics of a given proposal or narrative. If we further analyze the problem, it is possible to see that the underlying logic – specifically the ability to recognize logical fallacies, is very often one source of problems in critical thinking. Spotting logical fallacies like emotional appeal and reacting appropriately can prevent a significant proportion of security-related problems like the email phishing scam discussed earlier. They can also improve performance among managers and decision makers. 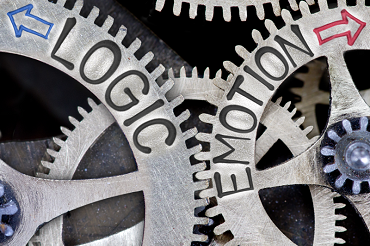 Ensuring a solid foundation in logical thinking, especially the identification of logical fallacy, can dramatically improve employees’ abilities to make good decisions and contribute more effectively to organizational and project goals. In practice this means that people in a business are able to discern good ideas from ones that are likely to fail. They are much more likely to spot fraud, to quickly discover innovative approaches that have a likelihood of success. Critical thinking skills are essential to the success of both individuals and organizations. Without adequate critical thinking skills it will be easy for your employees to fall into traps. They will be easy targets for anyone who wants to game the system and cheat them. And if they can be cheated, your organization can be cheated. Of course fundamental training in how to think critically remains essential, but given an audience that has some foundation in critical thought, augmenting such training with an overview of logical fallacies could play an important role in reducing problems. These skills could only be strengthened by a solid understanding of logic and logical fallacies. By training personnel in the aspects of critical thinking and the fundamentals of logical reasoning, employees will be much more prepared to handle the rapid fire influx of new ideas and concepts migrating into your organization from a myriad of outside sources. During his closing keynote for the 2016 Adobe Learning Summit in Las Vegas, Tridib Roy Chowdhury described these sources of learning. Whether it’s YouTube, Twitter, Facebook, or most commonly Google, people are increasingly likely to consult public sources for answers about the tasks that they perform in your organization. As Chowdhury explained, this ‘Google first’ modality of learning is already the norm, and our most common support architectures simply do not compete with the search ability and completeness of Google’s latest snapshot of the sum of human knowledge. Unfortunately, that snapshot is increasingly likely to produce results that have virtually no information for the consumer about the critical qualifications of the content on the other end of a search. At this point, the individual learner is generally the only line of defense between your organization and false information, an attempted fraud, or any other source of faulty information which can potentially cost your organization time, money, and resources. How Can Organizational Training Address This Need? When I speak with employers, one of the most common concerns expressed about new hires is the general lack the ability to think critically and solve problems with creativity and innovation. Our education systems generally do not include a lot of training in these areas. One of the few strong instructional approaches tied to critical thinking skills historically has been training in information literacy. This skill is most often relegated to librarians, and as we have witnessed the digitization of modern libraries – the opportunities for training in information literacy has rapidly declined. For the most part, educators use lecture and other didactic methods of instruction. This approach can be effective in some instances, but in general approaches to learning that encourage use of the information, and questioning of ideas and concepts are more lasting, and offer far more potential for meaningful use of the content. We see such methods employed in the sciences, and in the scientific method, which inherently aligns better to critical thinking. Perhaps the oldest method of teaching critical thinking is the use of Socratic Questioning rather than lecture and drill based training. In this approach, students are challenged with questions, rather than presented with information. Questions encourage the learners to consider a problem in much greater detail, to compare and contextualize new information to things they already know, and to consider the veracity of new ideas. These are all skills that employers highly value – and all methods that have been employed by effective classroom teachers for centuries. Using a Socratic approach to deliver content, learners do not passively consume information. They are challenged to answer questions about a topic, and guided by those questions to examine all of the information, ideas, and concepts that relate. This approach encourages learners to question the sources, debate the merit and logic of responses and form their own critical conclusions about the content. The trainer is able to evaluate the results based on the accuracy, specificity, complexity and relevance. But a Socratic approach is inherently expensive. It requires substantial investment in 1:1 training, or very effective group training. If training as a remedy to poor critical thinking skills is going to make an impact, it must scale well and be relatively inexpensive. Educational institutions should recognize the deficiencies in educational methods and begin significantly improving those methods in order to encourage substantially better critical thinking skills in young adults. But there is absolutely no reason to expect that educational institutions will accept or adopt that challenge. Therefore it is fundamentally necessary for organizations to provide supplemental education in critical thinking and logic in order to prevent the losses owed to the accidental introduction of false, misrepresented, fraudulent, or deceptive information that is propagated within their organizations. The world around us is rapidly changing. The availability of information and immediacy of communication enables us to adapt and learn at unprecedented speeds. But those who will excel in this environment of constant innovation will be the ones who are capable of discerning quickly the difference between sound information and ideas and those which are fraudulent, deceptive, or simply not founded in solid evidence. Likewise companies that thrive will be those that recognize, celebrate and cultivate critical thinkers – capable of questioning convention, exploring new ideas critically, and ready to uncover facts to guide their projects and decisions. In order to explore some of these ideas more fully, I have created the first of several learning activities focused on rapidly improving the identification and rejection of logical fallacies. The first one focuses on the fallacy commonly known as the gambler’s fallacy. This is an activity designed to explain the fallacy, and encourage the trainee to learn to identify examples of the fallacy in work related settings. 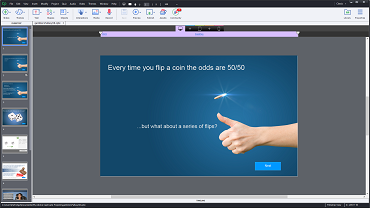 I’ll demonstrated how the aforementioned sample was created in Adobe Captivate 9, in an eSeminar on Gamification and Adobe Captivate. (NOTE: The seminar contains the download files for source of the Captivate project shown in this article.) Or if gamification seems a bit advanced, you are also invited to join me for an eSeminar for Captivate beginners, during which I’ll introduce the basic principles of course development. One of the most common problems that HR and eLearning professionals are facing is implementing modern, engaging Learning solutions. This is exactly the sort of thing that critical thinking can help solve. Whether you are trying to better understand your training needs or evaluating a Learning Management System, like Adobe’s amazing new LMS, the problem will be much easier to solve with critical thinking process in place. Still hungry for more? Consider reading ‘Engage the Fox’ by Jennifer Lawrence and Larry Chester.’ It is an absolutely enjoyable and engaging read on a subject that you might expect to be terribly dry.